NEW YORK, NY--(Marketwired - Dec 1, 2014) - Today, in honor of World AIDS Day, It's Not Over, a feature length documentary film made possible by the MAC AIDS Fund, the charitable arm of MAC Cosmetics, and now available worldwide on Netflix and SnagFilms, offers a global audience an inspiring look at how young people today are facing the challenges of HIV. 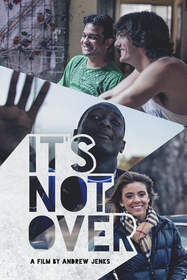 Viewed from the perspective of renowned filmmaker Andrew Jenks, It's Not Over tells the story of three young people from different parts of the world who are living with or affected by HIV in vastly different, yet astonishingly inter-connected ways. Jenks visits India, South Africa and the United States to experience the epidemic first hand. The result is a deeply personal and uplifting story that is rarely represented in popular culture. "Young people can end this epidemic, but to engage and motivate them toward this goal, we need to recognize that the era of PSAs and finger-wagging messages is gone. We've got to make them part of the solution, which we set out to do with this film," said Nancy Mahon, Global Executive Director, the MAC AIDS Fund. "It's Not Over represents the latest bold, creative strategy from the MAC AIDS Fund as we look to engage young people in impactful, meaningful, action-oriented ways to end the AIDS epidemic." Starting today, Netflix, the world's largest global streaming platform, is hosting the film for viewers worldwide, and SnagFilms, a leader in high-quality free film content, is making it available through its applications on Roku®, Xbox™, Sony® and more. Viewers will be taken on a journey, traveling all over the world with Andrew Jenks, to put a face on the AIDS epidemic. Partnering with three courageous young people, Andrew works to humanize the issue as they show us an inside look at how their lives are affected by HIV as well as the lives of those around them. In America, Jenks meets Paige Rawl, a college freshman in Indiana who has been living with HIV her entire life. After years of battling the harsh stigma and depression she turned everything around to become a powerful advocate for fighting the disease from dance marathons at her university to supporting other children impacted by the disease. In India, Jenks meets Sarang Bhakre, a Mumbai playwright who is openly gay in a country that outlaws homosexuality. Sarang's current play addresses gay marriage, and filmmaker Jenks is along for the ride, from rehearsal to debut, witnessing the courage and bravery it takes Sarang to face these issues. In South Africa, Jenks meets Lucky Mfundisi, a Soccer Coach and educator with Grassroot Soccer, an AIDS organization that teaches youth prevention through soccer. Lucky acts as a tour guide around Khayelitsha, the largest and fasted growing township in South Africa, with some of the highest rates of HIV in the world. Lucky shows Jenks how he is working to transcend the poverty with a message of hope and perseverance. "Young people will lead us to an AIDS-free generation. By ensuring adolescents and young people are aware of and have access to HIV services, we are not only saving lives, but also investing in a healthier future for generations to come," said Michel Sidibé, Executive Director of UNAIDS. "We are proud of the strong partnership we have with the MAC AIDS Fund to advance global efforts toward ending the AIDS epidemic." The subjects in the film are active with MAC AIDS Fund grantees including Humsafar, Grassroot Soccer and Camp Kindle. These partners have received grants to help fight HIV/AIDS through the MAC AIDS Fund, which raises funds exclusively through the sale of MAC's VIVA GLAM Lipstick and Lipglass. MAC donates 100 percent of the sale price to fight the AIDS epidemic and has raised more than $340 million to date. The MAC AIDS Fund, the heart and soul of MAC Cosmetics, was established in 1994 to support men, women and children affected by HIV/AIDS globally. MAF is a pioneer in HIV/AIDS funding, providing financial support to organizations working with underserved regions and populations. Recently recognized by Funders Concerned About AIDS as the top corporate giver in the arena, MAF is committed to addressing the link between poverty and HIV/AIDS by supporting diverse organizations around the world that provide a wide range of services to people living with HIV/AIDS. To date, MAF has raised more than $340 million (U.S.) exclusively through the sale of MAC's VIVA GLAM Lipstick and Lipglass donating 100 percent of the sale price to fight HIV/AIDS. For more information, visit www.macaidsfund.org. Documentary Film 'It's Not Over' debuts on Netflix and SnagFilms, telling the inspiring story of three courageous millennials from around the world who are living with or affected by HIV/AIDS.